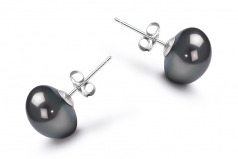 Interesting and Elegant, the substantial size of 9-10mm makes these Black Freshwater pearl earrings a rare treat. The magnificent mirror like lustre glistens off the smooth surface as it showcases the overall AAA button shape and creates a beautiful and desirable look. The classic addition to any little black dress, they look great for a date night out with that significant someone or just on a casual night out with the girls. 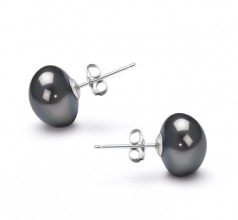 Taking into consideration the overall AA body and grade, you have a valuable pair of dyed black freshwater pearl earrings that can be the wear ever set that never gets put away.